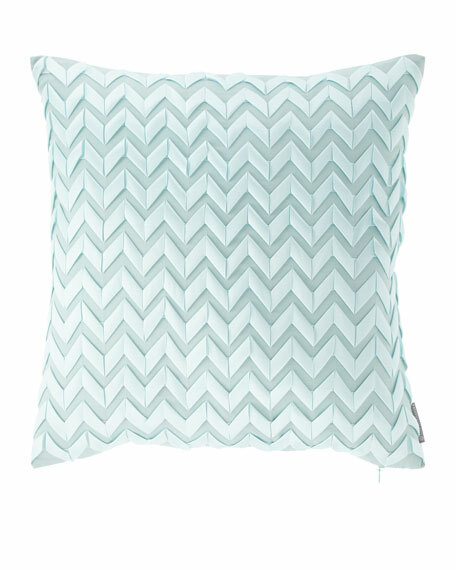 Lili Alessandra Chevron Pillow, 20"Sq. Textural damask pattern on one side; woven pattern on reverse. Mocha (Medium Gray), Jade (Light Green), or Bronze (Warm Brown) (listed as shown top to bottom). Brush fringe. Polyester fill. Dry clean. Made in the USA of imported polyester. Made of polyester. Mocha (Medium Gray), Jade (Light Green), or Bronze (Warm Brown) (listed as shown top to bottom). Polyester fill. Dry clean. Made in the USA of imported materials. Textural woven pattern. Mocha (Medium Gray), Jade (Light Green), or Bronze (Warm Brown) (listed as shown top to bottom). Brush fringe. Polyester fill. Dry clean. Made in the USA of imported polyester. Eastern Accents Celerie Kemble Wicking Cloud Pillow, 20"Sq. Handcrafted pillow with cord trim. Outdoor polyester insert. Sunbrella solution dyed acrylic. UV treated to resist fading and mildew. 20"Sq. Handcrafted pillow with cord trim. Outdoor polyester insert. Sunbrella solution dyed acrylic. UV treated to resist fading and mildew. 20"Sq. Spot clean. Made in the USA.